Is It True That Gum Disease Affects Your Heart? Ask a Dentist! According to the Center for Disease Control, heart disease is the leading cause of death for both men and women in the U.S. You’re probably already aware of the most common risk factors like obesity, high blood pressure, and a sedentary lifestyle. But there’s an additional risk factor that might surprise you! Gum disease. In the last 20 years or so, researchers have found overwhelming evidence that the gums and the heart are actually linked. But what is gum disease, how does it affect your heart and what can you do about it? Find out below! Gum disease (also called periodontal disease) affects an estimated 50% of the U.S. adult population. It damages the gums and underlying bone that support your teeth and keep them in place. In advanced stages, it’s one of the leading causes of tooth loss. Poor oral hygiene is one of the most common causes of gum disease, but other risk factors include genetics, smoking, and diabetes. How is Gum Disease Linked To Heart Health? Researchers think that one factor linking the gums and the heart is inflammation. What causes inflammation? Bacteria (which is what plaque and tartar are made of). The gums become inflamed when plaque, tartar and bacteria aren’t effectively removed from under the gumline. The result is bleeding, swollen or tender gums. The same bacteria under the gums that cause inflammation also enter the bloodstream, where they travel throughout the entire body, including the heart. Once there, they cause inflammation in the heart and can also cause plaque to form in the arteries. What Can You Do For Healthy Gums? The good news is that there are some simple things you can do to improve your gum health and reduce your risk for heart disease. 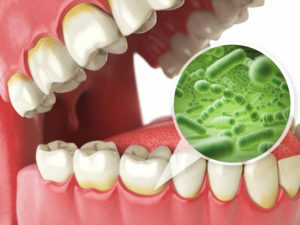 Gum therapy – There are some great professional treatments that can stabilize gum disease. The earlier it can be diagnosed, the more effective these therapies are. Hygiene habits – Routine dental care must be combined with good hygiene habits at home. Brush at least twice each day and floss once. You can also use tools like an electric toothbrush and oral irrigator to help you access areas under the gumline. Quit smoking – Tobacco use increases the risk for both heart disease and gum disease. Manage diabetes – Diabetes is also a risk factor, so working with your doctor to manage your blood sugar can make a big difference in your gum health. Now that you know more about how your gums are linked to your heart, you can see why routine dental care is crucial for both your oral health and overall health! Dr. Nelson Howard is an award-winning general, restorative and cosmetic dentist with over 30 years of experience. He’s seen how far the research has come on gum disease and heart health, and always shares the latest information with his patients so they can be as healthy as possible. If you have any questions, he can be reached via his website or at (858) 451-0550. Comments Off on Is It True That Gum Disease Affects Your Heart? Ask a Dentist!